Nine-thousand state employees are out of work today after lawmakers failed to reach agreement on a budget or pass a bill that would keep government running past midnight last night. A shutdown seemed unavoidable when the DFL-controlled Senate adjourned abruptly, minutes after Gov. Pawlenty announced he was hopeful there would be an overall budget agreement. The breakdown left Pawlenty and lawmakers blaming each other over who forced the shutdown. St. Paul, Minn. — With two and a half hours left before a partial government shutdown, DFL Senate Majority Leader Dean Johnson walked into a nearly empty Senate chamber and announced that the Senate was going to adjourn until this morning. The action ensured a partial government shutdown since House Republicans didn't support and later defeated a "lights-on" measure that would continue to fund government at current budget levels. Johnson and his fellow Senate DFLers passed that bill earlier in the evening. Johnson said the Senate did all of its work and felt negotiations with Gov. Pawlenty and House Republicans were going backward. "We're not here for show. We're here for good public policy and we think we've done that for the passage of the continuing resolution and we have finished our work for the biennium for which we're in," he said. Johnson's action was a surprise to many at the Capitol. Less than an hour before the Senate adjourned, Johnson had said they were close to reaching a deal. After the adjournment, many of his DFL colleagues were seen walking around the Senate chamber with their mouths open and their palms up. 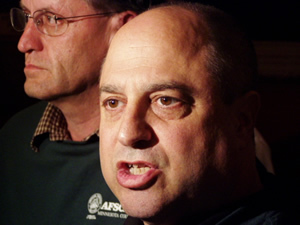 Officials with state employees unions were asking Senate DFLers why they adjourned hours before the midnight deadline. Eliot Seide, with the American Federation of State, County and Municipal Employees says he's angry with Gov. Pawlenty and lawmakers in both parties. "Everyone should have stayed here," he said. "I think everyone should be here working until midnight. My members are working hard every day. AFSCME members, MAPE members, state employees are working hard every day to deliver services. They worked to the end of their shift today in the hope that they can start their shift tomorrow and they don't get to start their shift tomorrow because nobody stayed and nobody did the right thing here tonight." Gov. Pawlenty and Republican House Speaker Steve Sviggum say they thought they were close to reaching an overall budget agreement with Senate DFLers. Pawlenty said experts in health care and education were still crunching the numbers to see if they had reached an agreement on those items. If they had, he said he was willing to support a bill that would have kept state government operating for 10 days while they hammered out the specifics. Now he says he's taking all of his proposals off of the table and negotiations are back at square one. Pawlenty said Senate DFLers took a political risk that a shutdown would make him look bad. "The Democrats punched out before their shift ended. I truly believe we could have done a deal tonight. I see the Democrats didn't want a deal. They wanted to have a partial government shutdown as part of a cynical political strategy," Pawlenty said. A partial government shutdown will have a limited impact on Minnesota. A judge ordered that state services relating to the health, safety and property of all Minnesotans must continue. Lawmakers and Gov. Pawlenty also averted the biggest political risk by passing a bill that would keep the state parks open. Earlier in the day DFL Sen. Tom Bakk of Cook urged his Senate colleagues to pass the bill so people can enjoy the parks on a busy holiday weekend. "Minnesota is watching," he said. "A whole lot of people who have made their vacation plans for this weekend are watching. 330,000 people are going to visit our state parks and campgrounds this weekend. They've got their car loaded and are wondering if they should leave the driveway." Many of those campers will notice one other effect of the shutdown while they're driving to the state parks. Highway rest stops will be closed. Students who want to take a driver's exam will also have to wait until a budget agreement is reached. House Speaker Steve Sviggum says he hopes to resume negotiations as quickly as possible so state employees and the state's government can get back to work. He says that's more important than the political differences that forced a halt in government services. "The issue of personal problems and policy problems absolutely pales in consideration of the government shutdown and it's consequences," according to Sviggum. Both the House and Senate are scheduled to hold floor sessions this morning. But finding agreement will likely be harder if compromises that nearly kept the government running is no longer on the table.